Alan Baker and Serena Lourie founded Cartograph to pursue their passion for wine after enjoying successful careers in other fields — he in public radio and she in health care and venture capital (see their bios for the full story). In 2008, Alan was working at the Crushpad custom-crush operation in San Francisco, making Pinot noir under his Cellar Rat Cellars label. Serena, on hiatus from her job in health care, came to Crushpad to learn the craft of winemaking and wound up working with Alan. During that first season making three wines together, they discovered that they shared two things: a similar palate and the dream of pursuing a life in winemaking. After a long shift in the winery in November 2008, Alan and Serena sat on the curb outside Crushpad and hatched a plan to make that dream come true. Shortly thereafter, they moved to Healdsburg, toting two barrels — 50 cases — of the Pinot they'd made at Crushpad. That wine became the first release under the Cartograph label, with the front of each bottle showcasing a map of the winding road that brought the couple together to create Cartograph. Two years later, they opened their first tasting room in a shared space, and moved in 2013 to their own space a block north of the main plaza in Healdsburg. In 2014, Cartograph was featured in the American Wine Story documentary, which showed at several film festivals and is available online via vhx.tv and Itunes. And in 2016, Cartograph purchased its first vineyard. Cartograph strives for sustainability in all aspects of their business. This reaches far beyond the sustainable practices in the vineyard but also to the winemaking process and even the business structure and employment policies. While Alan focuses on sourcing great fruit and making the wine, Serena runs the tasting room and focuses on building the business. Cartograph now produces 2,000 cases of wine annually, focusing mainly on Pinot noir, but including aromatic whites in the style of the Alsace region of France. Alan and Serena's goals: to make wines that impress with nuance and subtlety, and to show how elegant wine can be when the winemaking process involves sourcing from impeccable vineyards and using a light hand in the winery. 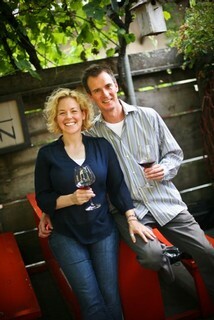 —Alan Baker & Serena Lourie, Owners, Cartograph Wines. Full biographies are located here. A “Cartograph” is a visual marking of ideas, either over time or place. 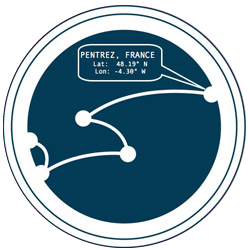 The cartograph on our labels is a visual depiction of the journey that brought us to winemaking and the ideas that have propelled that journey. It was in Pentrez, France, located in the rustic Bretagne region of my family's homeland, where I developed an appreciation for wine. Every Sunday our extended family would gather for lunch. Lili would make bread, Jacques would bring fish fresh from the morning's catch, Mamie would harvest veggies from the garden, and Grand-père would emerge from the basement with a sandy bottle of wine. You had to smell and taste every part of the meal which began my incredible journey into wine. Most of us can mark the time and place when where our fascination with wine first overcame us. Mine came while living in St. Paul. Floating in a small kayak on a lake in northern Wisconsin with a calm breeze rocking my little vessel, the sun was bouncing off the rolling water and I was surrounded by the North Woods. I opened a bottle of 1998 Alsace Riesling. Everything but the wine, with its cacophony of citrus blossom, pear, black tea and petrol aromas and flavors instantly disappeared. I was in the wine. How could a seemingly light and simple wine possess such an explosive combination of flavors and aromas that my remarkable surroundings simply faded into its shadow. It was that moment that somehow so engaged my senses and intellect that I embarked on a journey to learn all I could about wine, how it was made and how I might one day put such remarkable qualities in a bottle. It was in Washington, DC where I had my first taste of California wine. Sitting at a restaurant on the harbor, surrounded by friends we opened a bottle of Shafer Cabernet. I was mesmerized by the complexity of the wine and how blackberry, currant, and dark cherry flavors intermingled with tobacco and leather. The finish captured me and it was in that moment I felt to compelled to learn as much as I could about California wines. Eventually, I made my way to California and one of the first wines I made was a Napa Cab. We met in San Francisco, where both of us journeyed following the desire to engage our lives in the pursuit of winemaking. Alan moved there to make wine at Crushpad after producing his first wines in Dry Creek Valley. At Crushpad Alan made his first Pinot Noir to be sold under his Cellar Rat Cellars label. Serena too was drawn to this groundbreaking urban winery where she met Alan and he helped her produce her first wines. It was in this setting while working together, sharing wine while sitting on stoops and talking about our hopes and future, that our lives came together and our dreams for Cartograph took form. It is here, in Healdsburg, where our journey currently places us, and where we pursue our desire to turn our own journey into wines that will inspire others to appreciate a time and place with wine. For us, there is no better place to pursue producing great Pinot Noir than Healdsburg in Sonoma County. For Alan it is a return to the location where he first made wine, while for Serena the small town and fertile backyard of our new home recalls her family home in France. Most important, Healdsburg is close to the great Pinot Noir growing regions of California’s North Coast where we can carefully apply hands-on efforts through every phase of the grapes’ maturation and ultimately turn them into the place-defining wines we both strive to produce.